Kaan’s Stream Store! I bumped into this online the other day and was blown away. So cool. This is one of those things that made me say “Wow, this is the future of the web”. (Telapost is Latin for the future of the web, too). What is a stream store? A stream store is a physical brick and mortar store with a live stream which allows users to place orders right from their computers or mobile devices simply by tapping on the product on the shelf. Users can also interact with the store employees and ask questions via the live stream. Kaan’s Stream Store was the world’s first stream store. The physical store was streamed live onto the Internet. 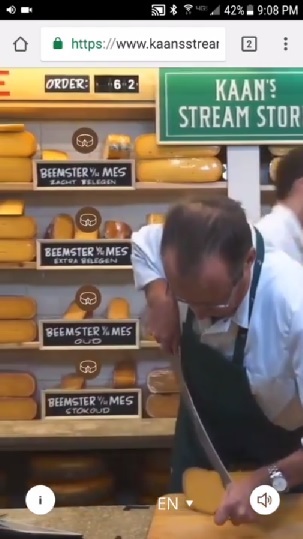 Users could swipe left and right to “move” around the store right from their phone and place orders by tapping on the product.In this case, the product was artisanal cheese. The stream store was a test which lasted 5 days. According to the test site, the new site will soon be up. I couldn’t help but notice the new site domain name is not yet registered, so anyone can buy it for $7.99. I hope they figure that out soon! Jan Kaan is a second or third generation cheese vendor. His sons wok at the shop as well. The experiment was sponsored by “Abn Amro Bank”. If you’d like to dip into the cheese story further, there is a good article over on DairyReporter and also on Vice. As for the stream store itself, it is now offline. I did take a very quick video of the store on Day 7. Unfortunately, I kept delaying taking the video while the stream store was in operation for 5 days. So in this video of day #7, you can still see me swiping around and checking cheese prices, however, the video itself was not recorded live. As you can see, the background video is clips from when the store was running. Can you do SEO for a Stream Store? A question that is probably on nobody’s mind but mine, is, “can you do SEO for a website like this?” The answer is yes, you can optimize anything for search engines. In this case there could still be plenty of text based pages on the site, including the home page. The Live Stream could be front and center for users to click on. That’s just my first, initial thought. Will Amazon take this over? I recently listened to The Everything Store. Of course, I played it via Audible, Amazon’s audio book service. In case you didn’t know, The Everything Store is the story of Jeff Bezos and how Amazon wants to be the store for everything. I don’t know how but I could see some boutique agencies offering custom stream stores or large corporations making a turn key Stream Store Solution. As a business owner who knows hundreds of other business owners, I know a handful of them who could use this and those are the same people who likely have no idea on how to set it up. In fact, in one interview I read about Mr. Kaan someone said he doesn’t even use email. Indeed, a search of his Netherland business revealed 2 locations (one in Hoorn and one in Alkmaar) and 0 websites. Would you buy from a store like this? Great concept and article! I especially like your recorded video. It’s imparitive your store setup needs to be (made) suitable for this concept and that the application can handle the traffic well, without compromising on user experience. Thus you would need to performance test a demo environment beforehand as the risk of degradable is huge I’d imagine.